Infratek has developed two state of the art high performance power analyzers, single- and three-phase. Unlike other instruments at this price level the 106A is designed to cope with the extreme signals generated on frequency inverter drivers. You do not have to worry about the signal wave forms. The analyzers will always provide precise and reliable measurements. The large and very bright monitor lets you read the display values from a distance of up to 4m. From checking the power of your coffee machine to determining the power parameters of a frequency inverter driven system, all tasks are simple. All values are displayed in large letters.They are easily readable, even in dark rooms. The user menu makes operation easy. You can print the measured values, send them to a PC via IEEE or RS232 interface, or send them to a chart recorder via the analog outputs. Infratek has placed much effort into the design of the 106A Power Analyzers to give you the highest performance at low costs. The analyzer inputs are all galvanically isolated, are broadband DC-300kHz, have a wide input range (0.3V - 1000V, 15mA - 40A), and have an exeptional common mode rejection for use in frequency inverter driven systems. The accuracy is 0.1% (0.05% versions are available). The bright LCD monitor displays up to 10 measured values in easily readable 9mm high numbers. 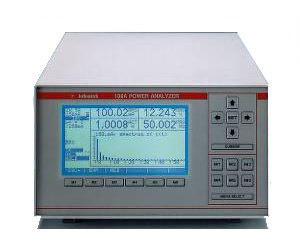 The Three Phase Power Analyzer sends up to 32 measured values on the screen. You have a choice of wave forms, bar graphs or trend plots. A unique feature of these instruments allows a combination of meter mode and graphic mode. Infratek is dedicated to power measurement and will continue to add features to the 106A. You can purchase upgrades at modest costs through your local Infratek distributor. The Power Analyzers are warranted one year and are supplied with a traceable calibration certificate.